Samsung is working on at least four different models of its upcoming flagship, the Galaxy S10. There will be an entry-level Galaxy S10 with model number SM-G970x and two premium ones with model numbers SM-G973x and SM-G975x. Samsung is also developing a fourth Galaxy S10 variant which will be the star of the S10 lineup. The former three models have already received their certification from the China Ministry of Industry and Information Technology (CMIIT). Now the top-end variant of the trio appears to have been certified in Russia as well. As is usually the case with these certifications, no hardware or software details have been revealed. However, the certification does confirm that a dual-SIM version of the Galaxy S10 model will also be available. The recently certified Galaxy S10 variants in Russia include the model numbers SM-G975F and SM-G975X. It is the top-end Galaxy S10 that received certification in China a few months ago. 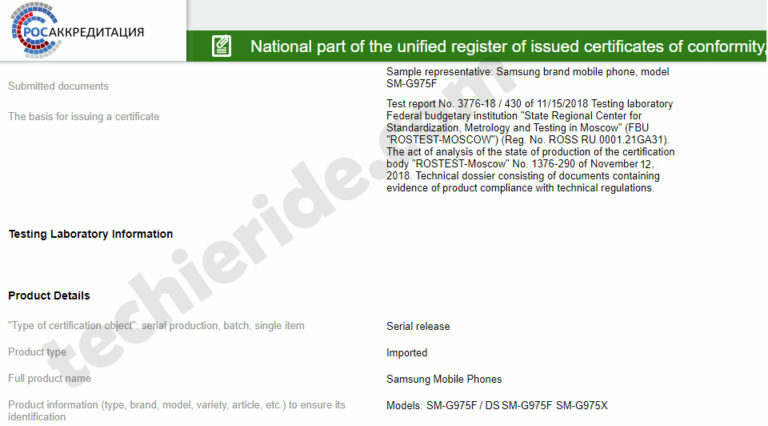 However, alongside these, one more Galaxy S10 model number has also received the certification. This particular variant should come with dual SIM card support. While nothing more about the phone itself has been revealed by the certification, earlier reports suggest that the SM-G975F will come with a 6.4-inch display. It could be a nearly bezel-less smartphone with 19:9 aspect ratio and 1440×3040 pixel resolution. It is also expected to sport five cameras – two up front and three cameras at the back, and an ultrasonic in-display fingerprint sensor. Samsung is expected to launch the Galaxy S10 at the MWC 2019 in February. And now with less than three months to go for the annual event, it’s very likely that we’ll see more of these certifications popping up from different regions and markets in the days to come. So developers need again to adjust apps to new aspect ratio ? Android doesn’t always require apps to have specific support for screen ratios, it scales automatically. And don’t forget that similar aspect ratios are already in use so apps are already working on those.